Successfully Added Car FM Transmitter MP3 Player Adapter to your Shopping Cart. Transmits music wirelessly from your MP3 Player or any other audio source to Car Radio. FM/ RF Transmitter powered by and for playing digital MP3 music directly in your car. 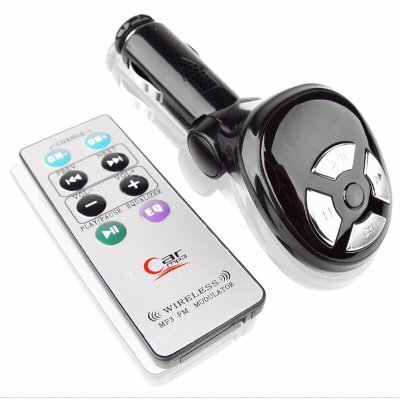 This MP3 gadget is a perfect choice for anyone who wants to listen to their favorite digital music directly in their car without the hassle of burning a music CD. With a audio Line IN, you can listen to anything from an MP3/4 to a CD player or other audio devices, and with the USB port, simply plug in a flash disk with music and it will play. As an added bonus, a male to male USB cord is included for powering this device from your computer or other devices with USB IN and letting you potentially play all your music stored on your computer on a radio. Great functions and a super low wholesale price has constantly kept this item one of Chinavasions best sold items..